The Institute for Sacred Architecture | Articles | Churches or Museums: Where Does Original Artwork Belong? Churches have always been built to celebrate Mass and the unity in faith. Celebration has changed according to time and creed. Moreover, the different branches of Christianity vary when it comes to the concept of holiness linked to the building or the religious objects in them. Among certain worshipers there is a tendency to “purify” the space and disregard the historic objects, while others cherish them and say they enrich the celebration and the appreciation of the church as well as the heritage. In many countries, the movables are considered inseparable parts of the building and its history. In Norway, the Heritage Act protects the architecture but not the movables. With the changing trends in heritage practice and liturgy, the religious objects lead a dangerous life. With shrinking budgets and churches taken out of regular parish use, there is a need for a more profound discussion about the value and ownership of the movables. On Sunday, March 8, 2009, the news came out that the only painting in a Norwegian church by the German sixteenth-century artist Lucas Cranach the Elder was stolen. The journalists immediately asked: “What could this Cranach be worth, and shouldn’t a painting like this hang in a safe, public gallery?” The possible commercial value of the painting became the hot question. Nobody asked about the artist or the painting’s significance for the church. The Danish-Norwegian king introduced the Reformation in Norway in 1537. At that time there was a surplus of churches, so only a few were built that century, of which none remain. Consequently the churches from the seventeenth century are in fact the oldest Lutheran-built churches. What is left of artworks and interiors from this period explains the “new” theology with a unique freshness. 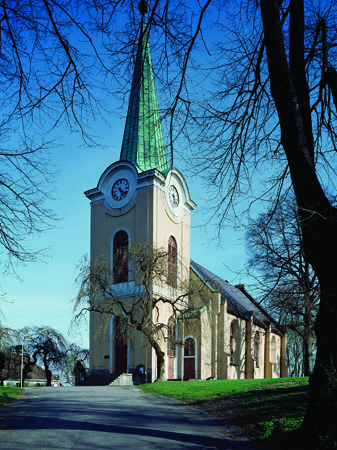 The parish church of Larvik, where the painting hung, was built in 1677, but was transformed into the present Neo-Romanesque church in 1859–64. The Cranach painting was one of the very few items left from the original interior. The painting dates as early as 1550, and depicts the story where Jesus welcomes the children and tells the disciples not to prevent them from coming to him. The biblical story is central to the Lutheran faith as it emphasises salvation by faith and grace alone. Count Ulrik Fredrik Gyldenløve financed the church. He married his third wife in it the same year, and donated the painting on that occasion. What value does this painting have for the celebration of the liturgy? The Lutheran churches are in general rather frugal compared to the Roman Catholic ones, but often more embellished than the Reformed. 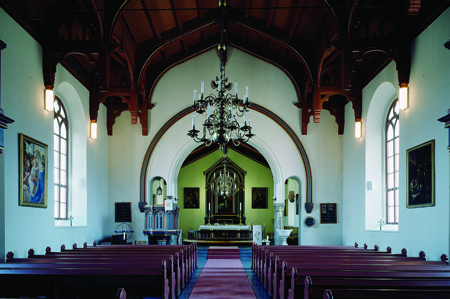 The interiors often reflect the Lutheran emphasis on the “word alone”; and so it is in Larvik. The Cranach painting does not play a part in the liturgy in this church. This is clearly emphasised by the fact that the painting hangs rather “hidden” behind the pulpit, in the choir, hardly visible for even those taking part in the Holy Communion. The concept of heritage value can include many things, like the understanding of the site, with the object as a part of a context or a part of a historical interior. In this case, the artwork is an important part of the history of the church and the region. The count built several churches and had a great influence on the church art in his county. However, the painting as an object is rather alien in the visual context where it is now. The identity value of the painting seems to be rather vague. Only a few of the parishioners will argue that it is a part of their identity. If it had such an importance, it would have hung more exposed. Since Cranach is a central painter in European art history and the history of the Reformation, the painting could, in the right context, have been a centrepiece in the National Gallery of Norway, where one of the two other Cranachs in the country also is. The painting would have been much more accessible in the National Gallery. Today it is not even on the international Cranach oeuvre lists. If the knowledge about Cranach and his paintings’ importance for the Reformation had been conveyed to the people of the parish, it could have added a deeper understanding of values lost in contemporary worship. The Cranach painting is now back in the church, which is far better secured than before. In 2009, the Victoria and Albert Museum (V&A) set up the spectacular exhibition Baroque to show the worldwide spread of Baroque art. 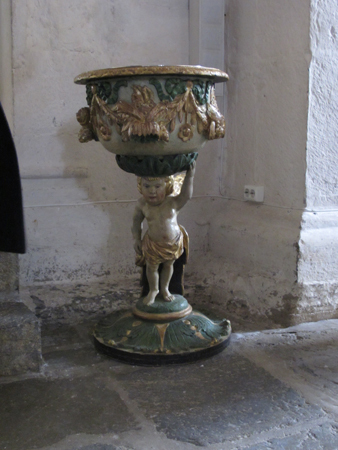 The curator, Dr. Michael Snodin, included a baptismal font from the Lutheran church of Ringsaker to show that Baroque art, originally inspired by the Counter-Reformation, also spread to the remote and Reformed northern European countries. In the exhibition, the font, made in 1704, was reunited with the embellished font house after about one hundred years of separation. The font house belongs to the Norwegian Museum of Cultural History, Oslo. Here it was in the V&A as the only Norwegian object, together with Baroque objects from all over the world. The complete lack of interest in Norway in the exhibition is a part of the history. Before the exhibition, the font was handled by the local church in an alarmingly casual way. The liturgical value of the baptismal font is obvious, even without the font house. The discussion leading to the removal of the font house is unknown. It is likely that the importance of visibility of the sacrament in today’s service would make it impossible to have the font house returned to its original use and site. The font house would have become a “museum piece” in the church. The font conveys an important part of the history of the medieval church, even if the font house was removed a hundred years ago. With the house in place, the heritage value, the opportunity to see and understand the significance of the sacrament of Baptism in the eighteenth century, would have been considerable. The present Baroque pulpit is from the same period and enhances the value of the font. There is an interesting visible sequence from the Romanesque church to the late medieval altarpiece to the Baroque font and pulpit to the nineteenth-century purifying restoration. The font has an identity value because all villagers since 1705 have been baptised in it, but the identity was not in the artwork itself. The fact that the V&A used the font in the Baroque exhibition shows that this, seen by many as a modest object, is of international interest. There are several such fonts in Norway, but not many with a font house intact. The quality of the craftwork on this particular font is also higher than that of others. In the V&A show, the objects were exhibited in an eye-opening context: next to a Latin American Baroque altarpiece. In the museum where the font house is today, it is hardly accessible at all. The church collection is mainly open to scholars, because of the lack of public interest in church art. The exhibition of the font, together with all the other objects and presentations at the exhibition at the V&A, put the object into a wide context, which made it easier to understand the religious and intellectual climate in the eighteenth century. The third case is somewhat different from the first two, because the artwork is a Madonna sculpture from the 1230s and consequently a Catholic piece of art, made in a completely different time for a different creed and a different religious context. 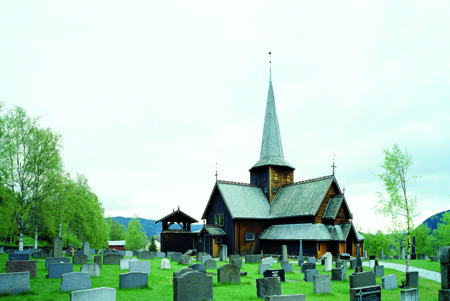 In Hedal, in the mountain district Sør-Aurdal, lies a medieval church built in the 1160s, entirely in wood. The church originally had a rectangular plan, but in 1699 the choir was demolished, the nave extended, and the church shape converted into a cruciform plan. Only the nave west of the spire of the present church is medieval. The church is still a parish church. The Madonna was originally in a shrine, used as an altarpiece since the eighteenth century. 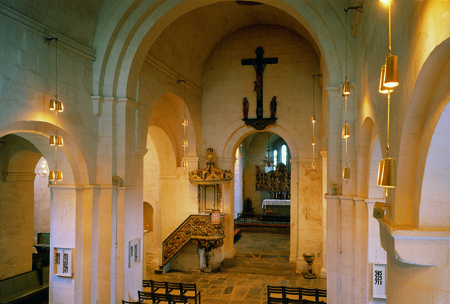 The top of the shrine, in the shape of a stave church, is also in the church, as well as a medieval crucifix and a reliquary, once containing a relic of Thomas Becket. Hedal is very cold in the winter. In 1957, electrical ovens were installed. At that time, the Madonna’s original colour surface was remarkably intact. It had never been repainted. Due to the new heating, the interior climate changed dramatically, leading to a drop in relative humidity, with a fast deterioration of the polychrome sculpture as a result. The wood dried and shrank, and the paint began to peel off. The Madonna was sent for conservation in 1969, and again in 1984. In this period, 17.5 percent of the medieval colour surface is said to have been lost. 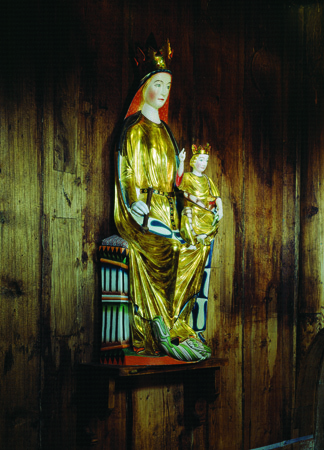 In 1986, an agreement was struck between the parish, the Directorate for Cultural Heritage, and the Museum of Cultural History: the Madonna should be exhibited in the museum in Oslo for fifteen years. In this period, the parish should try to change the climate inside the church, sufficient to have the sculpture returned without any danger of losing more original paint. In the 1990s, a detailed and accurate copy of the Madonna was made. The sculpture was carved, and paint was produced with methods and pigments as close to the original as possible. The project resulted in new knowledge about methods and material. The reconstruction shows the Madonna in very bright colours, probably even more astonishing in a time when the church was candlelit. In 1991, the original sculpture was once more conserved before being exhibited in the museum. The copy came on display in the church. In 2005, the relative humidity and indoor temperature were under control. The Madonna was returned to the church: a solemn occasion long remembered by those present. The most obvious value for art objects in a church is the liturgical—the significance these can have for the celebration of a service. The Madonna, on the other hand, cannot be said to have any liturgical significance, since the Lutheran church traditionally pays little, if any, attention to the mother of Christ. However, the objects could have a use linked to the religious practice outside the regular service. The Madonna could be an object of religious reflections and meditation, even if there is no strong tradition for such in this creed; there is a new openness in an ecumenical spirit. The Madonna is one of many links to the medieval past of her church. No one knows where she originally was placed or how the church looked like at the time she was installed. The only thing we know for sure is that the choir was removed in the seventeenth century. The Madonna has a strong identity value to the people living in the village, in spite of the official teaching. The removal of the Madonna was taken very seriously by the parish. At the return people shed tears, and the event was celebrated with a sermon, greetings, and a lecture, as well as a festive meal. If the Madonna would have remained in the Museum of Cultural History, she would have been one of the main showpieces, as she was during the fifteen years she was exhibited there. 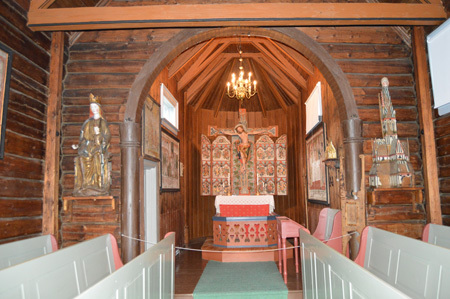 The collection is unique internationally: Norway has a remarkable number of medieval polychrome sculptures and altar frontals. The reconstruction of the Madonna gave a good understanding of the craftsmanship and the aesthetics of the medieval art. The detailed study of surface, sculpting, and paint unveiled secrets and gave new knowledge, as well as a better understanding of how important light, colour, and beauty were in the medieval liturgy. Where Do These Artworks Belong? The sociology of congregations and their relations to their churches is fascinating. The terrible record of church fires in Norway, many by arson, has made it possible to study this. When a church burns, the entire local community is affected. Even people who hardly ever go to church express their loss. The genuine grieving process tells much about the intangible value of the church and its contents. The loss of the church goes with a sense of loss of identity. The church building is a constant, the carrier of the local identity. Many want a copy of the lost church as a substitute. The community also has strong feelings for the artworks, the objects of historic value. The church is a place of memory, of identity, of the great events in life—a common space. 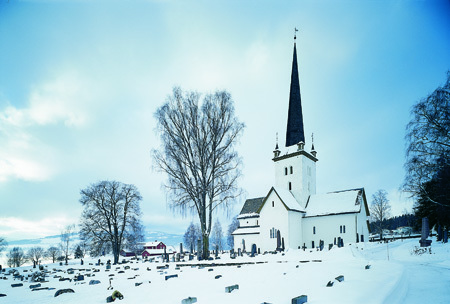 In Norway, humidity or the lack of humidity is a great challenge, especially if the church functions as a home for modern congregations. The church is a building in use, not a museum with a regulated, stable climate. Some of the objects are not only local heritage but also have national as well as international values. “Our heritage” often means the heritage of the national or even international community. 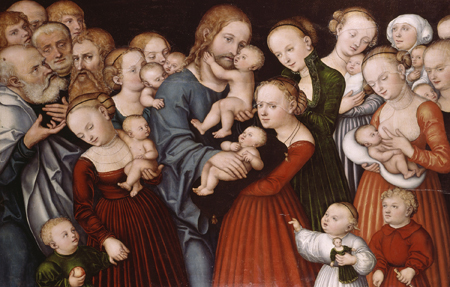 It is easy to argue that an original Cranach and the Madonna are world heritage. Should the security of our common international heritage be compromised because we want to see it every Sunday? At a certain stage, the joy and pride of having these original artworks in the midst of the celebrating congregation may become very expensive for the parish and risky for the artworks and even an obstacle to the contemporary service. There are many examples of the mismatch between the wishes of historically minded local communities and modern liturgists. One can still argue that the original artworks belong to the churches and the context where they were meant to be. Through knowledge, appreciation, and active inclusion of the artworks in worship, their presence usually adds a valuable intangible dimension to the service, as well as to the message of the service itself. Such valuable artworks can, on the other hand, only be in the churches on the condition that they are secured against theft and all sorts of damage, respected for their religious and scientific values, and available for scholars as well as worshipers of all kinds, including the heritage worshipers.